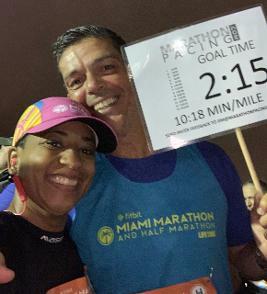 PACING PEOPLE PERSONALLY & UNOFFICIALLY BRINGING THEM TO DESIRED TIMES… CHICAGO 2010 FULL 3:50 (BY ACCIDENT), MIAMI 2017 HALF 2:00 A FRIEND WHO DIDN’T BELIEVE SHE COULD FINISH SUB 2:00, TAMPA 2009 (HALF) 2:00 A FRIEND WHO BROKE THE 2:00 TIME. IF YOU LIKE A TWO-WAY CONVERSATION RUN, IF YOU WANT TO RUN STRESS-FREE, IF YOU WANT TO REACH YOUR GOAL; JUST LET ME TAKE YOU TO IT. 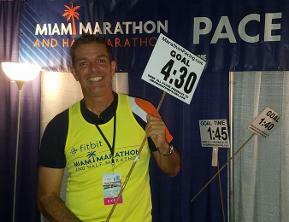 I PAY ATTENTION TO MINIMUM DETAILS, I CARE, I MOTIVATE AND ENCOURAGE RUNNERS. I WILL MAKE YOU FEEL THAT I’M THERE FOR YOU AS YOUR PACER, SOMEONE YOU CAN TRUST WHO WILL MAKE SURE EVERYTHING IS UNDER CONTROL. GET READY FOR 26.2 MILES OF FUN! BE READY TO BE UNDER CONTROL FOR 26.2 MILES; STEADY PACE FROM BEGINNING TO FINISH; FUN CONVERSATIONAL RUN. WENT TO AFRICAN COUNTIRES IN 2016 TO ANALYZE THEIR NEEDS AND OFFER SOCIAL SERVICES. CONSTANTLY HELPING CHILDREN IN NEED IN SOUTH AMERICAN COUNTIRES. RAN TO RAISE FUNDS FOR O.A.R. – ORGANIZATION FOR AUTHISM RESEARCH IN CHICAGO 2017.